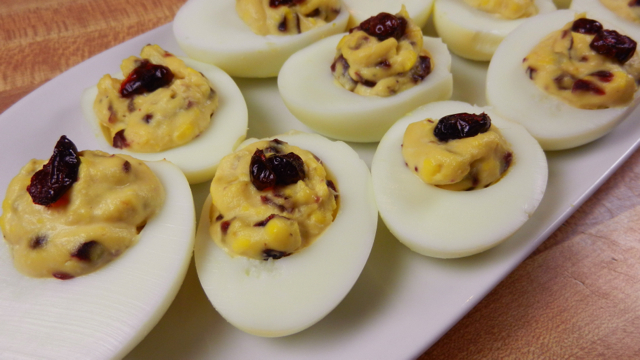 Deviled eggs are also ridiculously easy to make and incredibly difficult to mess up, which is important this time of year when you don’t have the time nor the energy to make a complicated snack for football. There is still shopping to do, you’ve got relatives over that don’t like football and you’re trying to entertain them while watching Eli versus Ed Reed and why YES it is very interesting that second-cousin Shirley got that job in Nebraska and YES it may make next Thanksgiving more difficult to plan and NO I don’t think the neighbors put up more Christmas lights than usual and NO I haven’t heard there is a Whole Foods going in there and WHY is it again I can’t feed this toddler bourbon so they’ll stop crying about the Grinch video AND DID ANYONE AT LEAST SEE A SCORE FOR THE VIKINGS-TEXANS GAME? Exactly. Not a lot of time for snack making for football. 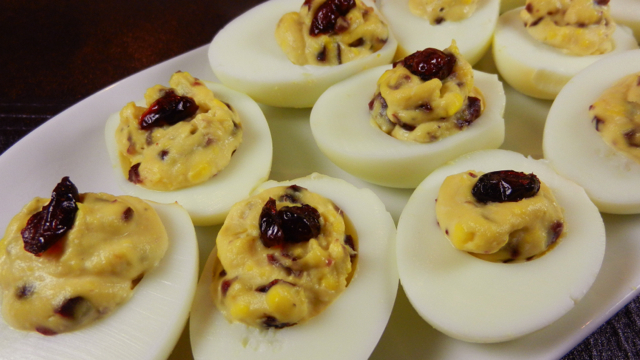 Full recipe for Tart Cranberry Deviled Eggs over at KSK today.